Garlic Chicken Puffs have a rich creamy garlic chicken mixture inside a croissant and baked to form a yummy appetizer. 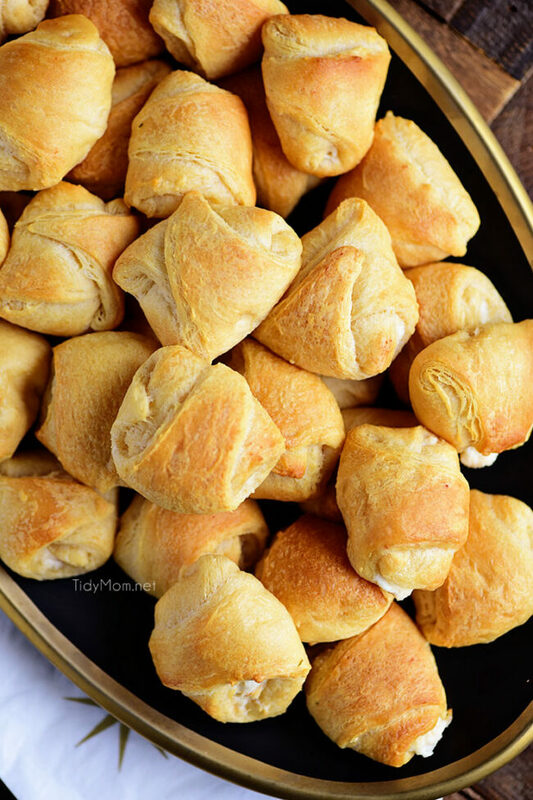 This finger food is a big crowd pleaser and great for gatherings! 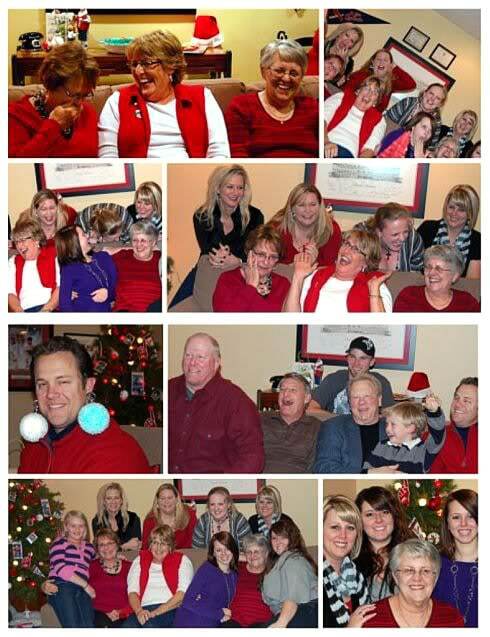 We had a GREAT time at a family Christmas party on Sunday. 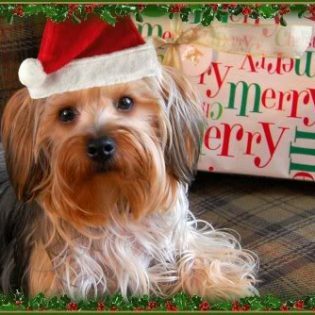 I have to share my aunts home with you all! 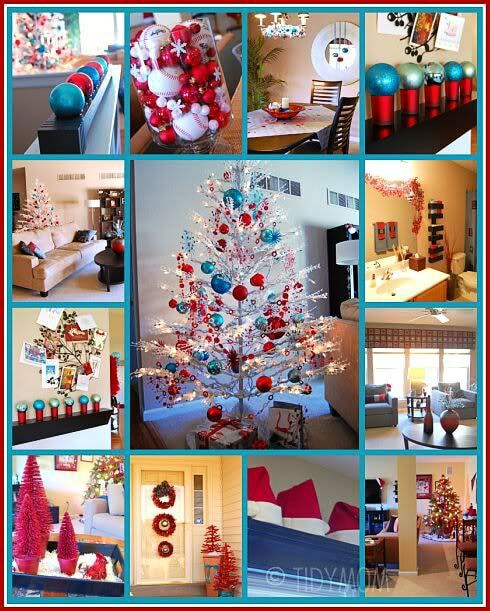 She decorates for Christmas in Turquoise and Red, and their finished basement is St. Louis Cardinals themed. Don’t you just love all the little touches? The ornament balls on top the votive candle holders! The Santa hats lined up on a shelf, the baseballs mixed with ornaments! That white tree changes colors, well the lights change colors, she also has these adorable red feather wreaths that I didn’t get a good picture of to show you, but they are adorable with a turquoise bow and turquoise ornament hanging in the middle! We snacked, we drank, we played a White Elephant Ornament Exchange, this year all 17 people played! Everyone brought an appetizer to the party. I brought my new favorite finger food. 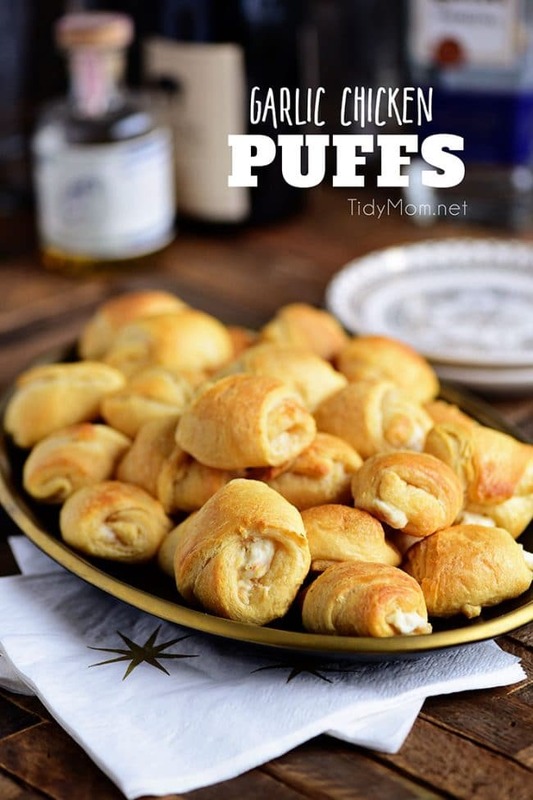 My niece made these tasty little puffs filled with garlic chicken a few months ago for another party. We all loved them and they were the first appetizer to go. So I called her to get the recipe. They are a little messy to make, and I think I filled mine a little too much, so some of the chicken mixture oozed out, but still tasted DELICIOUS! CHECK OUT HOW EASY THIS GARLIC CHICKEN PUFFS RECIPE IS TO MAKE! WATCH THE VIDEO! If you love chicken appetizer recipes the way my family does, you’ll want to check out these Buffalo Chicken Meatballs, Chicken Enchilada Puffs and Cheese Stuffed Chicken & Spinach Pizza Bread. Italian Eggrolls with Marinara Sauce, Buffalo Chicken Roll Up Appetizers, Bacon Wrapped Chicken Teriyaki Bites, and Green Curry Chicken Wonton Bites are on my list to try soon too! LIKE THIS GARLIC CHICKEN PUFFS APPETIZER RECIPE? PIN IT! 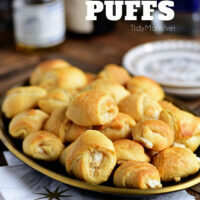 A rich creamy garlic chicken mixture inside a croissant and baked to form yummy puffs. A big crowd pleaser and great for gatherings! Preheat oven to 375° F and line a baking sheet with aluminum foil sprayed with cooking spray. In a medium bowl mix cream cheese, garlic, and shredded chicken until well blended. Place one teaspoon of chicken mixture in the center of each crescent triangle. Fold the corners over the chicken mixture and place on prepared pan. *For cooked chicken, I either use shredded rotisserie chicken, or I cook a few chicken tenderloins in a 350°F oven for about 25 mins. After the chicken has cooked and cooled some, I place it in the bowl of my electric mixer and beat with the paddle attachment to quickly shred the chicken. can you use puff pastry instead of creasant rolls? I’m gonna try these for Easter but I’m going to use shrimp with a scampi seasoning I purchased. Might even try crab for a crab ragoon tasting appetizer. thanks so much for the recipe and the inspiration. I just made these and they are sooo good! I added a smidge of buffalo wing sauce to about half of the recipe, drizzling it on the crescent roll triangle before adding the chicken mixture, then rolling them up and pinching the ends closed. They were the first to disappear from the platter! oooh, that’s a fabulous idea! I’ll have to try that next time! I made these today for a family picnic. I doubled the filling and used 3 cans of crescent roll and the ratio worked well. They’re good but to be honest I think I’d like them better without the chicken and a tiny bit less garlic powder. All in all though it’s an easy appetizer to throw together and tweak to your liking. This one is a keeper! Does anyone put anything else in the recipe to spice it up? Can these be made ahead and put in the refrigerator until baking? I finely chopped jalapeño ices and added to mixture… A few dashes of hot sauce too..